We are hosting a video workshop! You’re probably starting to get organized for the beginning of the school year. Maybe you have been thinking about incorporating new resources or displaying older content in a different way. Maybe you have students who are in a different province or country that you are trying to reach out to and build a better connection with. Video could be something that creates these connections or brings new life to static content. We don’t expect you to have amazing equipment or grand ideas. This kind of thing starts small and that’s where we come in. During this brief 2 hour workshop we will talk about the basics of planning, shooting, editing, uploading and sharing video. This is a very simple overview of an area that may interest you and that could light the fire. We want to encourage creativity and curiosity in this workshop and everyone will go home knowing a little more about video production! If you would like to join us register here. If you have any questions about this workshop contact Kristy McKinney at kmckinney@upei.ca or elearning@upei.ca. August is Moodle Bootcamp month! Register now! 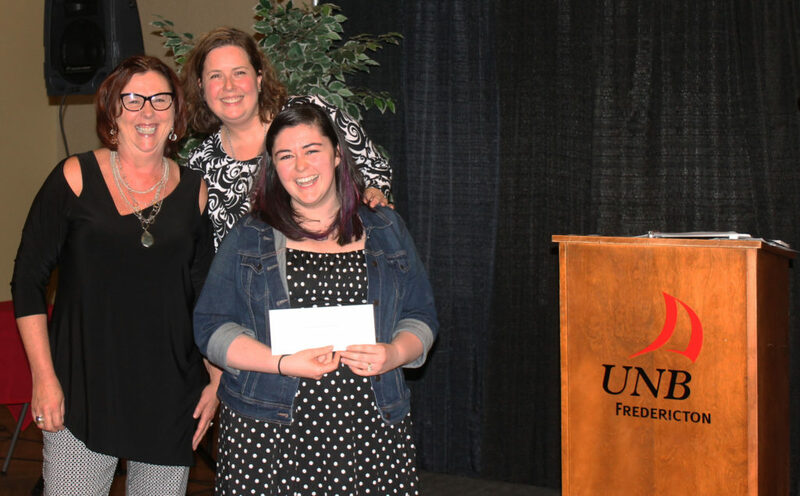 Moodle is UPEI’s Learning Management System or LMS, which means that it’s a big collection of tools that we use to help support classes, whether they’re face-to-face, hybrid, or fully online. There’s a lot that can be done in Moodle, but it can be a little difficult to learn, and you might be wanting to see what else you can accomplish in Moodle. So the E-Learning Office is taking the month of August to run our own Moodle Bootcamp. Week 4: Special Topics (we’ll be asking participants to select what they want to talk about that day). If you’re interested in learning a bit more about Moodle please join us by registering with this form. 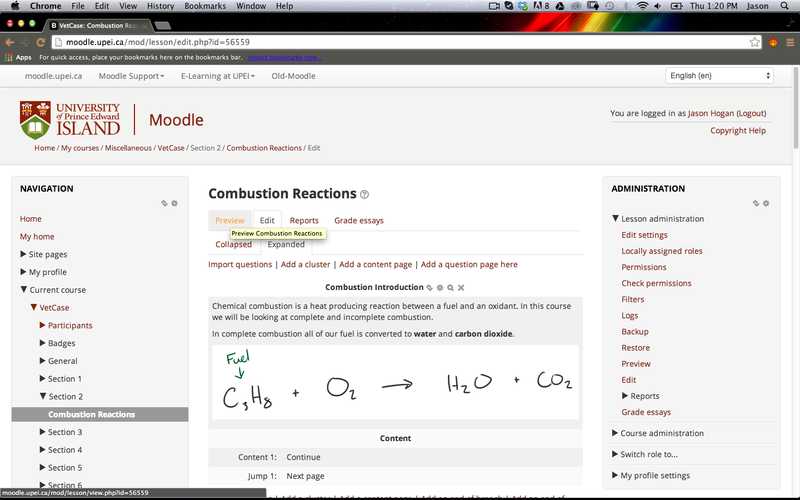 You might be using Moodle to host some of your activities online, things like quizzes, discussions, assignments, etc. 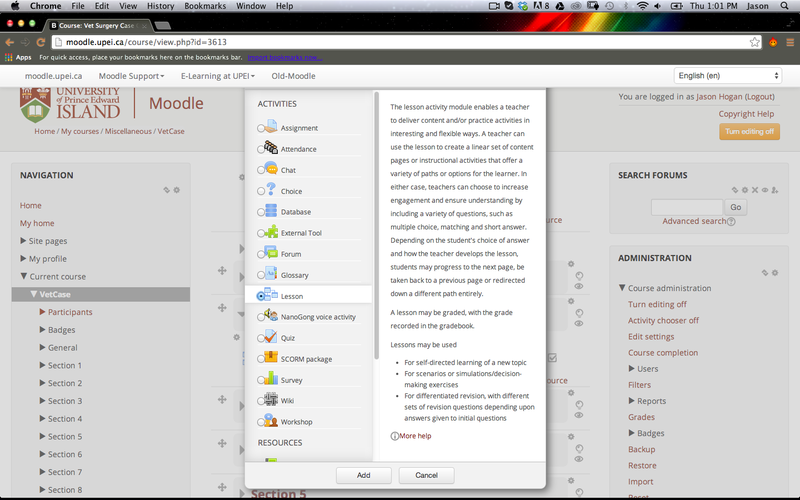 but one of the activities that you can use is Moodle Lessons. 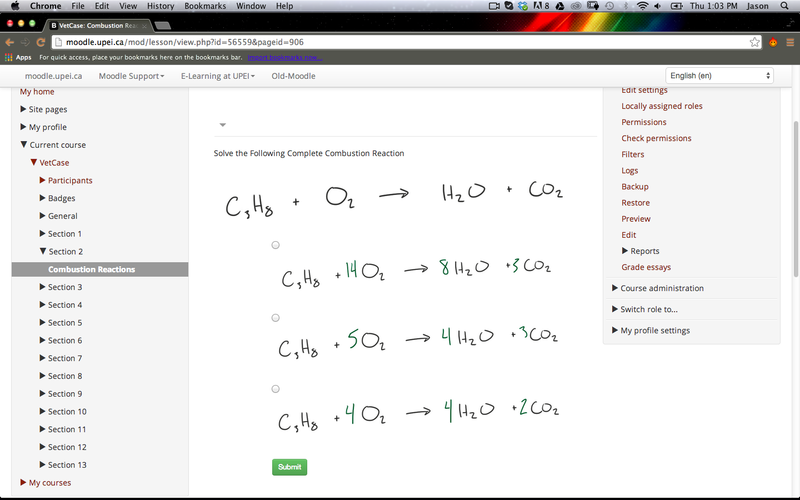 Moodle Lessons let you create linked pages of information and questions. This means that you could have an online lesson that increases in complexity while checking for misconceptions or pitfalls through each stage. You could build a very simple version of this with a quiz activity, but Moodle Lessons can be a much more robust tool for helping clear up misconceptions and confusion. Where a quiz will let you give students specific feedback on an incorrect answer a lesson lets you create branching paths. This means that if a student goes through a lesson and answers a question incorrectly, instead of proceeding on in the lesson, they can be given a different path to address the confusion and provide more practice before being able to continue the lesson. Another way to use branching decisions is to let students make choices in the lesson, for example you might want to make a decision based simulation. 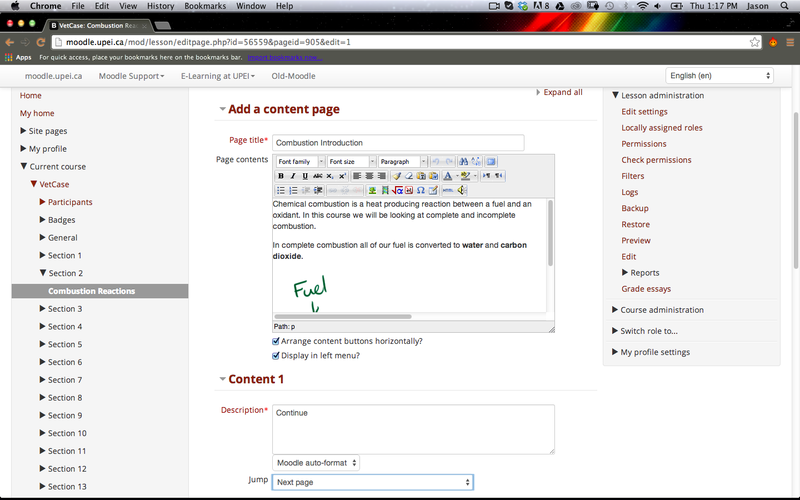 Moodle Lessons have three types of pages that can be linked together. The links between pages are called jumps. The first type of page is called a content page- this is an HTML page, so this could be used for linking a video, discussing an image or explaining a topic with text. If you’re familiar with posting in a Moodle forum, a content page can show anything that you can show in a Moodle forum post. The second type is a question page- these pages are framed around different types of questions: Multichoice, Essay, Short Answer, True False, Matching, and Numerical input. Question pages can also include content, for example you may create an essay page with a link to an article or with an embedded image or video and ask students to use the provided space to explain three key points, or reflect on the piece or critique what was presented. One thing to take note of is that questions are limited to having as many possible answers as you have content jumps. This means that if your maximum number of jumps per page is 4, you can set 4 possible answers for a multiple choice question. 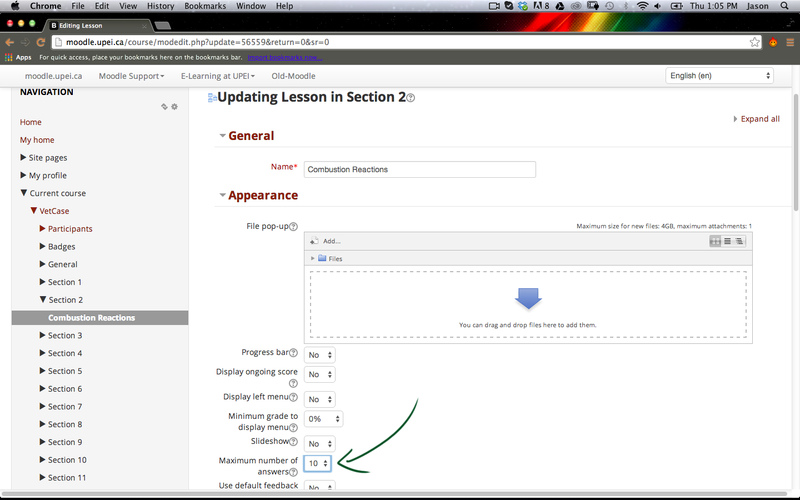 If you want to increase this number, it can be changed in the appearance settings of the lesson module. Changing this limit will change the limit for all your pages. The final type is a cluster. A cluster is a series of questions that can be presented in a random order, so for example, if you were building a lesson about a topic in math, you may want a series questions between content pages. 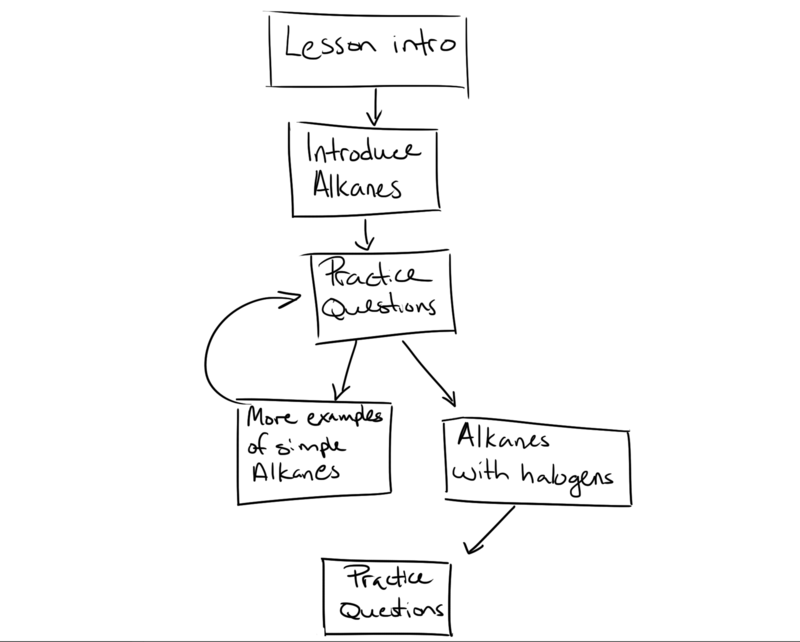 Before setting up a lesson, you should sketch out your paths on a piece of paper and map how you want to connect your content. This can help you sort out your content, and determine the number of jumps you need to allow. To create a lesson go to your Moodle course and turn editing on, add an activity or resource to the section where you want the lesson. From the list choose Lesson. Name your lesson, under the appearance tab and then choose your maximum number of jumps or answers by selecting the dropdown for maximum number of answers. Set this value as needed. This number can be changed later if you make a mistake or want to change it later. Make any further changes you need to the settings and click save and display. You’ll then be taken to a page asking what you’d like to do, choose what type of page you’d like to create to get started. 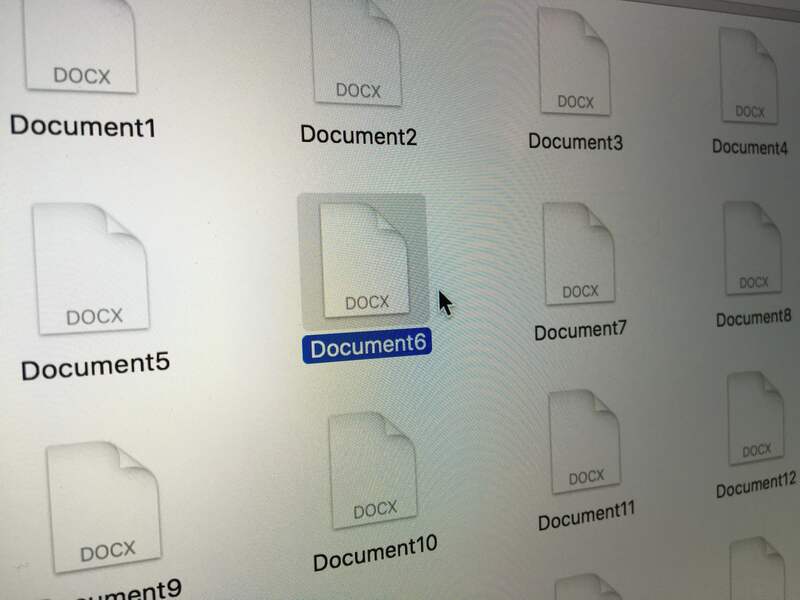 When editing a page, you will have to give that page a title, the title will show up in the tab for the page, it will also be the title for the page when your setting your jumps, so providing a useful title that is unique to that page rather than numbering the pages will help you later on. The next piece is a HTML editor, here you can format images, text, embed videos or link to other sites. Next name your jumps or answers. These sections are set to Moodle’s autoformat, but you can change these sections to HTML by selecting that option from the dropdown, saving and reopening the section. 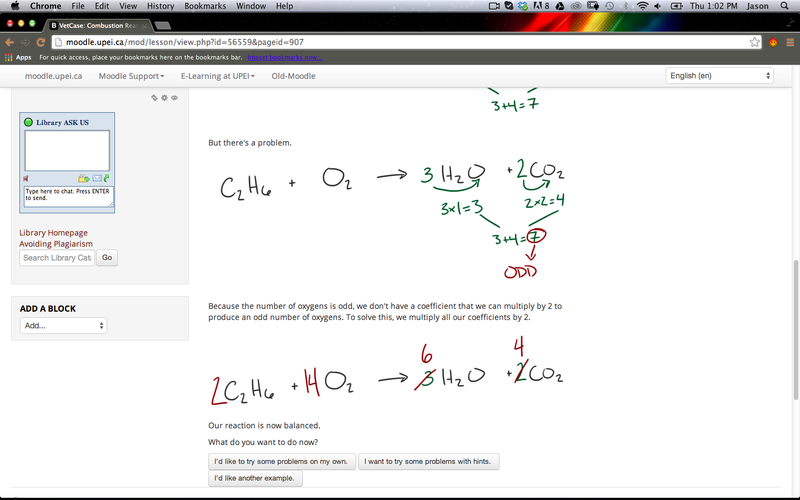 HTML will let you use images, formatted text, links, etc in your answers. The description is the text that will show up on the button, it doesn’t have to be the same as the jump. So for example, you might link to your introduction page but write “Go back to Start” in the description. Once you’ve filled in this content save your page. 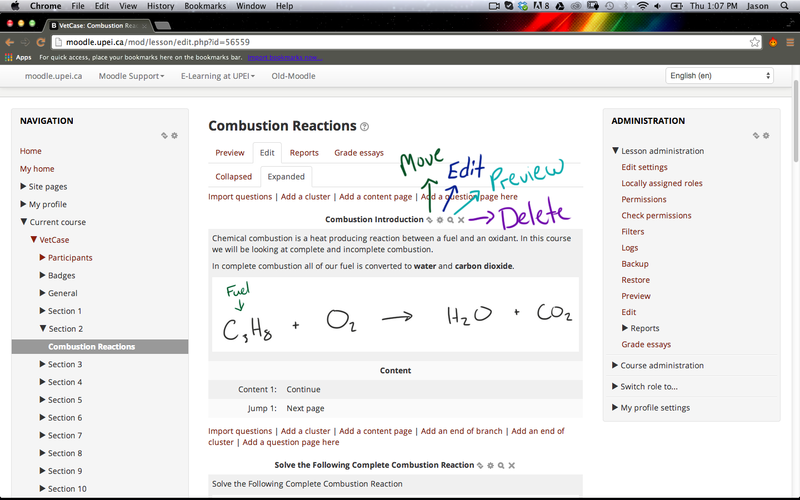 You’ll be taken to the lesson editing page, here you can add more content, questions, or clusters. You can also reorder content by clicking on the move button, you can edit it by clicking on the gear button, you can see what the page will look like by previewing it with the magnifying glass, or you can delete it by clicking on the X button. Take the time to create all of your content pages before worrying about setting your jumps. 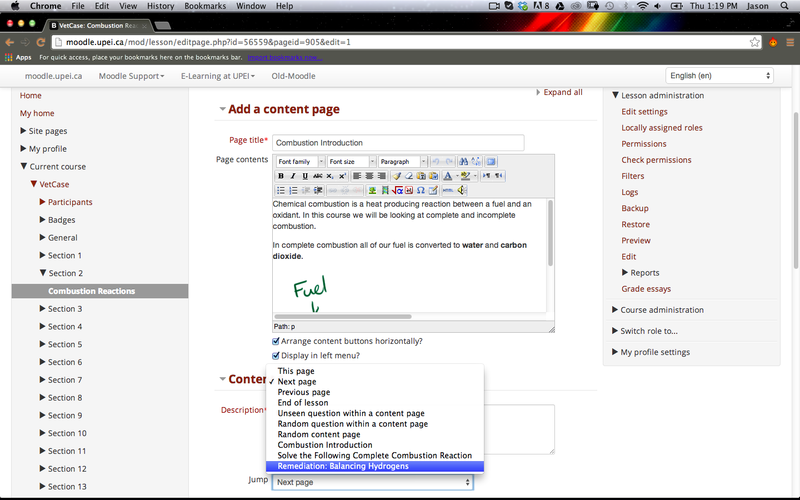 Once you’ve completed your pages, return to the top of the lesson editing page and edit your pages. With the jump dropdown, select the page title for the page you would like each button to jump to. If you’d like to end a branch, choose the “End of Lesson” option from the dropdown. Once all of your jumps are set, your lesson should be ready. 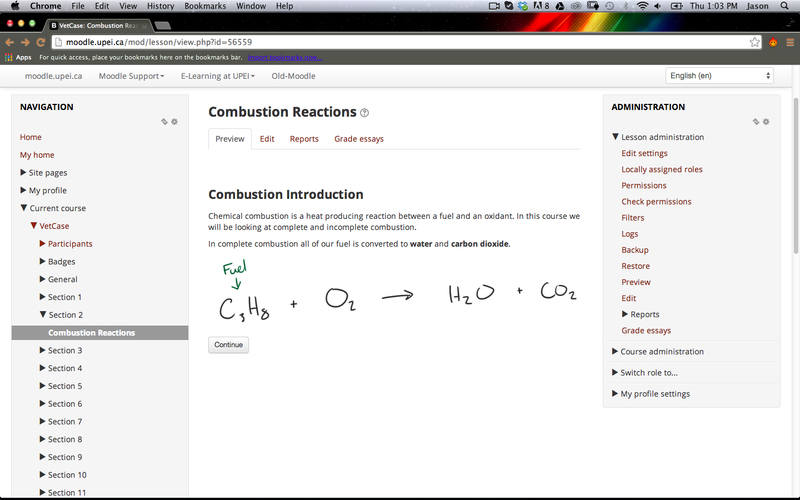 You can press the Preview tab at the top of the lesson editing page to test your lesson as a whole. After you’ve gone through the preview you, the lesson should be ready for your students.